Good drivers aim to reduce and manage the inherent risk that you may injure or kill yourself or others while driving. The factors discussed here increase the risk of crashing for all drivers, and especially for new drivers. Alcohol, drugs and some medicines reduce your ability to drive safely. Crash risk increases as your BAC increases. A BAC of .05 doubles the risk. Learner and probationary drivers must stick to zero BAC - no alcohol at all. Drink driving offences carry severe penalties. Relicensing after cancellation for drink driving requires the fitting of alcohol interlock devices for at least 6 months. Alcohol remains in your system for some time after drinking. This can result in a test above zero BAC the morning after. Drugs can affect driving. There is a zero tolerance to drug-impaired driving. Ask your doctor/pharmacist how prescription/over-the-counter medicines can affect your driving. Mixing alcohol, drugs or medicines is worse than any one by itself – having a few drinks and some cannabis is the same as a very drunk driver. The faster you go, the greater your crash risk and the severity of resulting injuries. Speed is a factor in almost 20% of fatal crashes and about 30% of single vehicle crashes (running off the road). Speeding is riskier for new solo drivers as it reduces your margin for error and gives you less time to do the things you have to do like scanning, effective hazard perception and correct decision-making in every situation. Any mobile phone use (including hands-free and texting) while driving is dangerous because it takes your attention away from the road and therefore increases crash risk. Learners, P1 and P2 licence holders are not allowed to use a hand-held or hands-free mobile, and are not allowed to send or read any text messages. Fully licensed drivers must not use a mobile to make/receive calls, unless it is securely fixed in a holder or can be remotely operated. To make/take a call, pull over safely and park (not in emergency lanes as this is illegal). handheld computers (PDAs and tablets) and computers. VDUs (e.g. DVD players) operating and visible from the driver’s seat or which may distract another driver are illegal - even when stopped, but not parked. Drivers’ aids (e.g. mounted GPS) are excepted. Penalties include fines and licence suspension. Passengers can reduce distraction by helping with tasks like changing a CD, but you should avoid carrying more than 1 passenger during your first year as a solo driver. P1 licence holders must not carry more than 1 passenger, aged between 16 and 22. Any distraction that takes your attention and eyes off the road might have serious consequences. Reducing your risk by resisting any temptation to do something other than concentrating on driving is important, especially in the first months as a P driver. Careless/dangerous driving and failing to have proper control of a motor vehicle laws apply if a distraction causes you to drive inappropriately. Penalties include heavy fines, demerit points, or licence suspension or cancellation. Wearing a seatbelt increases the chance of crash survival for drivers and passengers. Drivers will be fined (plus demerit points) if passengers are unrestrained (including child restraints for children under 7). Passengers over 16 will also be fined if unrestrained. Most crashes happen on short trips so seatbelts must always be worn. Driving with unrestrained passengers in the boot, ute tray or a passenger’s body part outside the door/window is dangerous and illegal. Fines and demerit points apply. In crashes, unrestrained occupants are often thrown from cars or tossed around inside. People thrown from cars are up to 25 times more likely to be killed than those who remain in the vehicle. Buying a safe vehicle will protect you and your passengers if you crash. Larger cars with more safety features provide better occupant protection than smaller cars with less safety features. The most important safety features you should get are airbags and Electronic Stability Control (ESC), which are fitted during manufacture. To ensure Antilock Braking Systems (ABS) work properly in an emergency stop, keep firm pressure on the brake pedal even if the car vibrates or shudders and the brake pedal pulsates. To confirm if a car is fitted with ABS check the owner’s manual. Vehicles should be regularly maintained by an expert. Tyre pressure and tread depth need to be maintained at safe levels. Tyre problems are a common cause of defect related crashes. If you have a tyre blowout, keep a firm grip on the steering wheel, take your foot off the accelerator and brake gently when the vehicle is under some control. Hazard perception skills are limited while inexperienced (despite quick reaction times). Drive at a safe speed under the limit. When you see any potential hazard (pedestrians, cyclists, turning vehicles) slow down and move your foot on or near the brake so you can stop if needed. Create a buffer to give you more time to react to the unexpected. Going 2 or 3 km/h slower won’t delay you, so slow down a bit! Crash risk and injury severity increases with speed. In a 60km/h zone crash risk doubles every 5 km/h you exceed the speed limit. Speeding penalties include fines, loss of demerit points, and loss of licence. Note when the vehicle in front passes a marker in the distance (signpost or tree). Count the seconds until you pass the same marker. If not at least 2 seconds, you’re too close. Heavy vehicles take longer to stop and change direction. They need larger safety margins to drive safely. Do not move into their safety margin. If a vehicle behind is too close, increase the margin in front by slowing down (if safe). This prevents sudden braking by providing more time to respond to hazards. Make sure you have space around you before changing lanes by scanning fully. Keep back at least 200m when following another long vehicle in a road train area. Don’t focus just on the vehicle in front. Scan constantly. Look into the distance, to both sides and behind you using mirrors. Practice and think about road users’ intentions. Supervising drivers can help with this and you can use time as a passenger to practise. Plan your trips using familiar routes (where possible) before you start out. This reduces workload and stress while driving. Night driving is more complex than day driving because you can’t see as far in all directions making it harder to anticipate hazards. The 10-hour requirement isn’t much, so get as much night practice as you can when you are with your supervisor. Once licensed, keep night driving to a minimum, particularly in the first few months. Slow down at night so you have more time to identify and respond to hazards. Crash risk is higher at night, with 1/2 of all probationary night crashes on Friday and Saturday. As country roads present a variety of conditions (sealed, unsealed and gravel) get as much practice as you can as a learner under a variety of weather and light conditions. Always driving cooperatively, even when others are not. Giving others plenty of space so they don’t feel you are invading their space. Concentrating on driving and changes in conditions (speed, roadworks etc.). Acknowledging if you make a mistake. Trying not to react to others’ mistakes - it’s a mistake not a personal attack. Using headlights or the horn only to warn others about a dangerous situation. Not making offensive hand gestures. If you encounter an aggressive driver, don’t take it personally. Drive normally and try not to react. If hassled or confronted, keep your doors and windows locked, don’t get out. If you are very concerned, drive to the nearest police station. 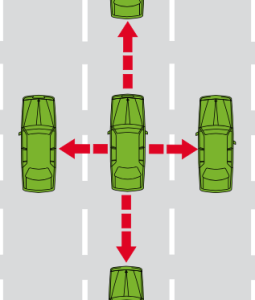 Give the other driver plenty of space: if they are in front, increase the gap, and if they are behind you, maintain your speed or provide an opportunity to pass. ‘Eco-driving’ techniques can reduce your car’s environmental impact, save you money, and keep you and your passengers safe. You can start eco-driving when you are in Stage 4 of learning, or once you feel more confident after getting your licence. Avoid hard or unnecessary acceleration and severe braking. Decelerate smoothly by releasing the accelerator and leaving the car in gear. Don’t take off too fast - otherwise you could use 60% more fuel. Slow down and maintain a steady speed. This uses less fuel (110km/h uses up to 25% more fuel than 90km/h). Use cruise control when safe. Maintain distance from the car in front so you can flow with traffic. Tailgating causes unnecessary acceleration/deceleration and increases fuel use. Space provides time to see and anticipate situations, and minimises fuel use. Don’t use your car if possible (public transport, carpool, walk or cycle instead). Take less trips by planning ahead and combining trips. Reduce travel by going to nearby shops, and walking or cycling to local shops. Keep tyres inflated to the highest pressure recommended in the manual. Low tyre pressure increases fuel consumption. Get regular services to save money and minimise your environmental impact.